If you have a quick question or just want to say hello, a phone call is always a sure way to get you sorted. But for a thorough run down of your bike, nothing beats letting us check it out in person. Once upon a time we almost named our shop “Just Bring It By” Cycles, so when in doubt, you know what to do. No appointment necessary! 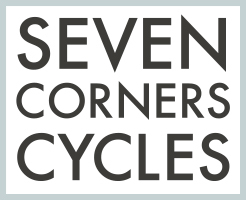 Seven Corners Cycles loves you very, very much!